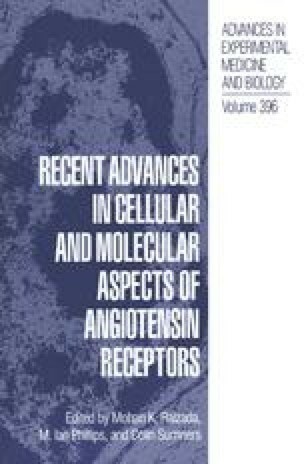 One of the prominent actions of angiotensin (Ang) II in the central nervous system is the stimulation of water, and in some cases NaC1, intake (1, 2). Either peripheral or central administration of Ang II induces water intake in water-replete animals. The dipsogenic effect of peripheral Ang II is abolished by either lesions of, or Ang II receptor antagonism in, the subfornical organ (SFO). The SFO is a circumventricular organ, and the fenestrations between capillary endothelia allow leakage of circulating Ang II into the parenchyma in the core and posterior parts of the SFO. The SFO has a high density of Ang II receptors most or all of which are subtype 1 (AT-1R) in rats (3,4). The SFO has efferent connections to other forebrain areas known to be involved in either fluid intake or neuroendocrine action, including Organum vasculosum of the lamina terminalis (OVLT), median preoptic nucleus (MnPO), supraoptic nucleus (SO) and hypothalamic paraventricular nucleus (PVH). Some of these pathways are reciprocal, and some may use Ang II as a transmitter (5, 6).